Get a great deal on this Pocahontas Two-Movie Special Edition (Pocahontas / Pocahontas II: Journey To A New World) (Three-Disc Blu-ray/DVD Combo in Blu-ray Packaging) which is now available on Amazon for pre order. The price is shown as $27.99 but you can get an addition $8 off with the discount coupon. Remember that as with all Amazon Coupons you need to be logged into your account for it to show up, and also the discount is shown in the checkout, not on the product page. Pocahontas is not the only movie to have an $8 coupon. Here are some more of the deals available with this discount. 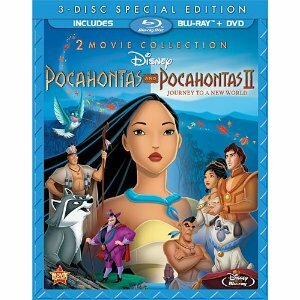 Pocahontas Two-Movie Special Edition (Pocahontas / Pocahontas II: Journey To A New World) (Three-Disc Blu-ray/DVD Combo in Blu-ray Packaging) $19.99 Shipped and released on 21st August. Lady and the Tramp 2: Scamps Adventure (Two-Disc Blu-ray/DVD Special Edition in Blu-ray Packaging) will be released on August 21st and is available for $19.99 Shipped with the $8 discount. The Aristocats (Two-Disc Blu-ray/DVD Special Edition in Blu-ray Packaging) $19.99 Shipped> This movie is released on 21st August. The Rescuers: 35th Anniversary Edition (The Rescuers / The Rescuers Down Under) (Thee-Disc Blu-ray/DVD Combo in Blu-ray Packaging) $19.99 Shipped. Released on 21st August. Remember that will all of these pre orders if the price decreases between your order time and the end of the day of the release date, you’ll receive the lowest price. Huge List of Printable Coupons! Crocs Deal of the Week: Mackenzie Shoes just $19.99 Shipped!